Here’s our favorite faux-conservative commenting, right after the big Republican gains in the last election, about that party’s view of climate change (i.e., it’s either not happening or IT’S NOT OUR FAULT). As far as I know, 72% of the members of the previous House of Representatives Committee on Science, Space, and Technology were either outright climate-change denialists or have voted against bills to reduce global warming. That’s a travesty. This entry was written by whyevolutionistrue and posted on December 4, 2014 at 2:22 pm and filed under climate change. Bookmark the permalink. Follow any comments here with the RSS feed for this post. Both comments and trackbacks are currently closed. A huge misconception is the belief that bills can reduce global warming or manipulate the global environment. Bills are pieces of paper and they have yet to combat poverty or illegal drugs use. Being against political solutions for all of society’s ills doesn’t make one anti-science. ??? Bills (I presume you mean legislation) most certainly can, and do very, very effectively, combat poverty. They can also either negate OR increase wealth gaps. Bills also combat (but not very effectively and at huge societal cost) illegal drug use. A bill that liberalizes and regulates drug use at the Federal level would likely have a very positive effect on the ‘illegal drug use’ as well as being an economic boon. Of course being in favor of a smaller government does not make on anti-science, but I think the point of this post is that being anti-science has the potential to make someone a horrible legislator. It seems that those perons in Congress in favor of smaller government are disproportionately ignorant of science or feign ignorance for political expediency. That’s an overly cynical attitude. There have been many pieces of legislation that have helped the environment tremendously: The Clean Water Act, the Clean Air Act, the Migratory Bird Treaty Act, the Taylor Grazing Act, the Endangered Species Act, and so on. Climate change is especially challenging because it requires a global solution, but there’s precedent: The Montreal Protocol on Substances that Deplete the Ozone Layer. But the biggest challenge is the benighted Republican Party, corrupted by big-money interests. Incentivizing low-carbon energy technologies would go a long way toward reducing carbon emissions, as would taxing carbon pollution itself. Legislation is about the only tool that can work, given the cheap abundance of fossil fuels. Ewchewing legislative action as a panacea does not make a group of people anti-science, but making repeated anti-science statements surely indicates something – actually being “anti-science” is the best thing you can say about the Republican Party: there is a high probabability its members understand science (including the dismal one), but take cynical, climate- and economy-harming positions for political gain. And, by “political gain,” I mean serving the interests of corporations which fund their campaigns and give them lucrative post-service lobbying jobs, against the interests of the, you know, human race. Being “anti-science” would actually be a step up from that. And just to point out, Titles IV and VI of the Clean Air Act, mentioned above, contributed substantially with the reduction of acid rain and the hole on the ozone layer. These are enforced by regulatory agencies and, in the case of ozone protection and other amendments to EPA codes, were drafted to bring the U.S. into compliance with international treaties. So, no, a single law passed by Congress and signed by the President doesn’t magically solve every problem it addresses, but many, many pieces of legislation have helped to ameliorate problems at least a little. And I read the news today, oh boy: an abrupt upward swing in job creation and an abrupt downward swing in unemployment coincide precisely with the passing of the 2009 Recovery Act. Further, job creation in 2014 has been consistently and historically robust, contra fearmongering over the effects of ACA implementation. This is an example of legislation having a direct positive impact on poverty, as jobs and affordable healthcare are the greatest anti-poverty weapons there. What are you talking about? What makes these people anti-science is that they are anti-science! Just listen to what they say about global warming and the science behind it and it should be clear it’s more than just the belief that legislation won’t change things. Can we somehow just quickly skip over the next ten years or so of US history? If we do that we might miss everything, literally everything. Thank you for sharing a video that your international readers can also watch. It was nice not to read that message laughing at my accent and the fact that I haven’t moved to America yet. Thank you. In other words, how much of the IPCC’s projected 1.1°C to 6.4°C of warming will the U.S. be responsible for in the next century? The answer is about 0.08°C of the low end estimate and about 0.35°C of the high end estimate (according to an IPCC-like analysis*). So all the U.S. carbon dioxide emissions restriction tactics—EPA regulations, cap and trade schemes, carbon taxes, efficiency programs, guilt-inducing ad campaigns, etc.—are aimed at chipping away at this already tiny 0.2°C. Big deal. If the U.S. (or any country) takes the lead in reducing carbon emissions it would be a big deal. That’s how LEADERSHIP works. It means doing things and taking actions that will make it easier for other countries to follow. Bold action would also spur research and technological innovations that create economic opportunities, and those who lead the way are in the best position to prosper from those opportunities. Oh, and we might even keep the planet habitable for lots of species that depend on stable climates. Seems like a good bet to me. FWIW the U.S. and PRC combined produce about 40% of the the world’s CO2 emissions, so, to your point, leadership and reductions by the big dogs will have a substantial impact. I don’t understand the number salad in the “big deal” comment: the U.S. produces 15% of the world’s CO2, how a significant reduction results in infinitesimal effects is kind of hard to follow. The U.S. also has the highest per capita output. The do-nothingists in Australia are always citing the factoid that we produce ‘only’ about 1 or 2% of the world’s CO2. I don’t call that infinitesimal either. A typical “we’re just so special, we don’t have to do anything” attitude. Since the US has about 4.4% of the world’s population – which is expected to decline a bit by 2100, Americans would still be responsible for a disproportionate share of the world’s warming, even using your lowest estimate. Got any more lame excuses? *I use Jesus Christ here for rhetorical and comedic purposes only. Who said that America will be doing anything alone? It’s time for the US to step up to the plate, because the time for vacillating and doing nothing is over. EU and perhaps other places got very excited about the US/China agreement on AGW. It is too little, too late, but it means the next round of climate talks may net more than talk. With a fulcrum, you can move the world. US has been expected to be that fulcrum on AGW since the 80s- It is time to stop hiding behind faulty excuses. *Whether you go by its waning part of the global population or global economy, still being among the largest influences. The E.U.-15 and U.S. haven’t been raising per capita carbon dioxide emissions since the 1970s, when the E.U.-15 stopped substantially catching up with the U.S. in RGDP per capita. 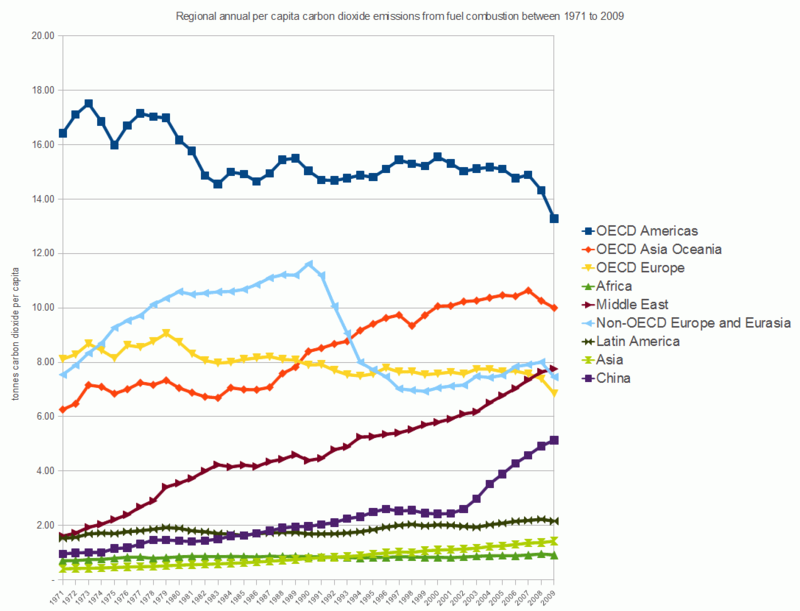 The collapse of the U.S.S.R. led to a collapse in carbon dioxide emissions from Eastern Europe. And, as you know, the U.S. Official Poverty Measure bottomed out in 1973. These facts are all related. America’s, Russia’s, the Middle East’s, and China’s middle class would not exist were it not for the burning of fossil fuels. It’s an open question if that middle class can continue to exist if these places’ net carbon dioxide emissions turn negative. The Soviet Bloc (which apparently permanently cut its carbon dioxide emissions by nearly one-third in the 1990s) used energy far, far less efficiently than the capitalist countries did, so one major source of extremely inefficient carbon dioxide emissions has ceased to exist, thus making it certain that the long-run marginal costs of future carbon dioxide emission cuts will be higher than the long-run marginal costs of the 1990s’ carbon dioxide emissions cuts of former Communist Europe. Gibberish. But thank you for playing. Well, if you have no argument, I guess I can’t give you any more. Well if that’s how these cats roll, then here’s my proposal: Rather than having the U.S. government impose taxes or mandates, instead we’ll just get the verbal agreement from various power plant owners that they promise to switch to totally renewable energy sources by the year 2030. To quote the climate deal, let’s just get them to say that they “intend” to reduce carbon dioxide emissions. They don’t have to do anything in the meantime, showing their progress toward that goal; we just want their word. And if 2030 rolls around, with a different group of shareholders and CEOs running these companies, they can ignore the previous “intention” of somebody sixteen years earlier with no penalties whatsoever. Note the Latin America and Africa lines. These regions were economic dead ducks between 1980 and 2003. When you look at the about page of maasterresource.org you’ll see that one of its main contributors, Robert Bradley, is the CEO of Institute for Energy “Research” — it’s a small world, isn’t it? Of course I knew that. The very book The Master Resource was written by Robert Bradley. Very funny clip but it’s more than a little sad that all these not-a-scientists have their hands on the levers of power in the word’s biggest economy. When did TV audience whooping/hollering become the norm & why? Never mind that, why did someone feel the need to plaster a big cartoon TV set over the image, blocking some of the image? I hate when YouTubers “embellish” videos with their own incompetent editing. You think it’s bad when an audience laughs at a comedian’s jokes? And thanks (about the cats). I see the Germans can now opt to have all their electric power come from nuclear plants as a way to fight climate change. Surprising in a country as fanatically anti-nuclear as Germany. They like solar in Germany too. A lot. Ireland made our targets under Kyoto by careful legislative approach, co-ordinated research programs with both public universities and government agencies….only kidding we had a recession that lead to a collapse of the building sector so our reduction was purely due to no longer pouring large amounts of concrete. I was at a discussion with a teagasc advisor, who couldn’t get his head around the fact that increasing the national herd size was a bad idea. Thanks to most all the comments that came after the first one to add a bit of dignity to the post at hand. For some strange reason I suspect that person might just be from the republican side of the U.S. of A. Either that or from FOX news where there is also no sense of humor and perhaps not much sense either. Isn’t George P. Bush among Jeb’s offspring — the group of grandkids that Bush paterfamilias, born with a silver foot in his mouth, pointed out to Ronnie & Nancy as “the little brown ones”? Our country is in a ridiculous state. It is embarrassing. I feel sorry for future generations. The video was funny though. And yet they don’t say “I’m not an economist ” or “I’m not a banker but…”. Duh, that’s why they say all those things of reducing tax for the rich (‘trickle down economics totally works people!’)…but you know, the poor: charity will take care of them. This guy is scary as sh*t.
Never trust someone who would take the ramblings of a plagiarist Bronze Age people over testable facts. -That’s actually true, though not for the long run. I’m not a doctor which is why I’m going to repeal Obamacare, ya’ll! I’m not a woman which is why I believe I can dictate what happens to their bodies. I’m not a lawyer which is why I say all those stupid things about bringing Gawd into the Constitution. Note that Senator Inhofe is of Oklahoma and that is just one step away from Texas. One theory has it that the dust bowel caused evolution to stop and then reverse direction. Whatever it was, this guy as your leader on Science, Space and Technology is as useless as screen doors in submarines.